Next year, this couple will get married and it will be amazing, but a few months ago, we got together for an engagement session at the Patuxent Wildlife Refuge. The goal of our engagement sessions is not primarily the images—though they’re an important part too, of course. Rather, the point is to get to know one another and develop a comfortable working relationship so that the wedding day can go as smoothly, and be as much fun as possible. Get to know one another we did! This couple has a style that is all their own, fully embracing the absurd and with a flair for quirk and showmanship. 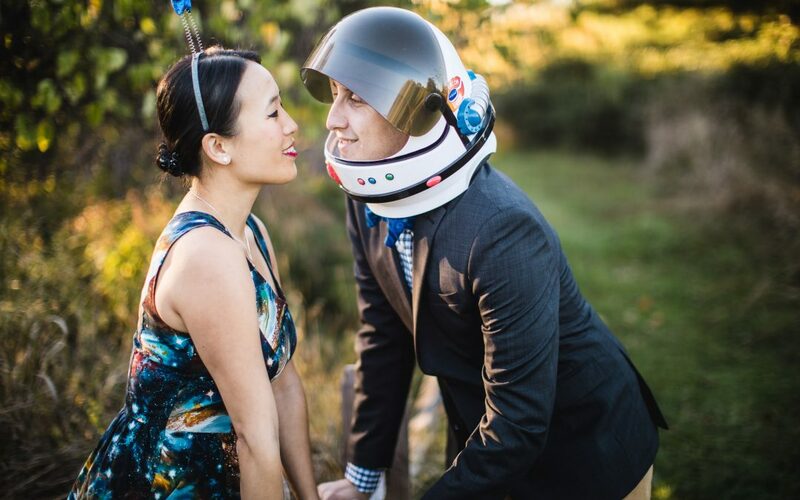 They arrived ready to mash up the ‘traditional’ modern engagement session with a space-girl outfit and a thrift store space-man helmet. We ran with it, making images from the goofy and nonsensical to the romantic and serene. Besides the outfits, most of our session was off-the-cuff, speaking even more to the lighthearted approach these two have taken toward life. It was a blast. We’ll be shooting this couple’s wedding next year, but check out some of our favorites from the engagement session below. If you’re looking for someone to capture images at your wedding, check out the Wedding Photography pages here on our website! We’d love to work with you!